Luke 6:45 (NIV) - A good man brings good things out of the good stored up in his heart, and an evil man brings evil things out of the evil stored up in his heart. For the mouth speaks what the heart is full of. • Congratulations you finished the 1 Year Curriculum! Use the Graduation poster to create a precious photo op to remember today. Be sure to tag #ABCJLM or @ABCJesusLovesMe when you post it on social media! While in the bathtub, give the child measuring cups to pouring water. This play helps the child learn how to control the water as she pours. Pick up bean bags and throw them. Congratulations! 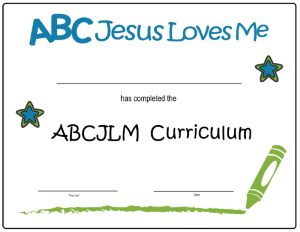 You have finished the ABCJLM 1 Year Curriculum. Click to being the 2 Year Curriculum now.